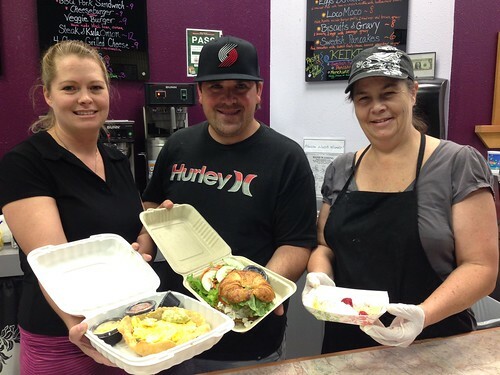 Maui Zing just opened up a few days ago in the Main Street Promenade, the modest food court along Main Street that services Wailuku businesses, visitors and residences. The restaurant has a hearty breakfast and lunch menu and is open from 7am to 5:30pm. It does have a certain zing to it. The recipes on the menu are a combo of Joe’s and Lily’s family style favorites. At breakfast, their Swedish Pancakes ($6) are described as thin cakes filled with fruity cream sauce and powdered sugar. Jamie says they’re stupendous, and they made me a sample. While I was waiting she got out their vat of lilikoi butter that her mom Lily makes and gave me a spoonful. She says they will make it until lilikois are out of season. They serve it on pastries du jour. The breakfast menu is the most extensive I’ve yet seen at the promenade: egg sandwiches, eggs and potatoes, Eggs Benedict, biscuits and gravy, loco moco and burritos. But I digress. 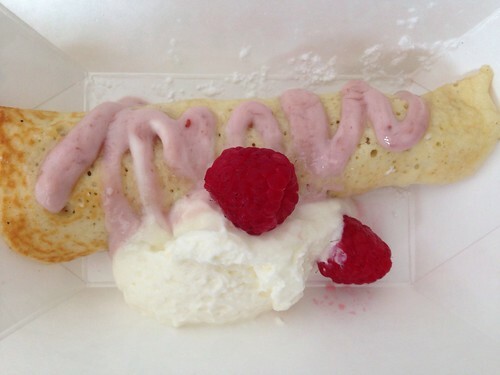 The Swedish Pancake is a European treat–a thin pancake, not a crepe, formed into a jelly roll with fruity cream and topped with a dollop of fresh whipped cream and a few raspberries. 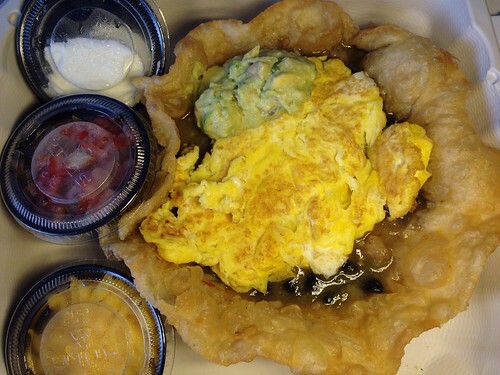 It was great, but I ordered the Huevos Rancheros that Barnett makes with her own special Lily’s green chili sauce. It’s more American than Mexican, with kidney beans and black beans in a deep fried tortilla bowl, green sauce, eggs made to order (I got scrambled), cheese, salsa, sour cream and guacamole, but it works marvelously because of Lily’s sauce. 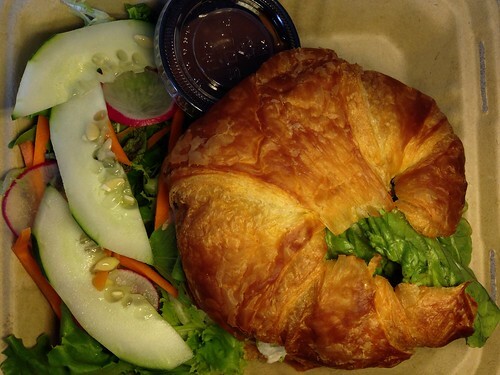 For lunch, I tried their chicken salad sandwich on croissant ($9). They have a full list of sandwiches from BLT to Reuben to burgers, all made to order with your choice of breads, tortillas and cheeses running from $9 t0 $12. In the chicken salad, real chunks of roasted and chilled chicken met onions, celery, pine nuts and grapes, along with Kula Dave tomato slices and green leaf lettuce. It was really good. The turkey bacon avo features their own oven roasted garlic and black pepper turkey on ciabatta with garlic aioli, and is also spectacular for $10. I was surprised to see the menu also included jalapeno poppers with ranch, beer-battered zucchini sticks, onion rings, fresh cut fries, hand cut chips and fried artichoke hearts. I’m thinking BYOB pau hanas might be in order with their deep fried selections. They also have a complete selection of salads, a burrito, chimichanga, smoothies, milkshakes, lemonade and soft drinks.